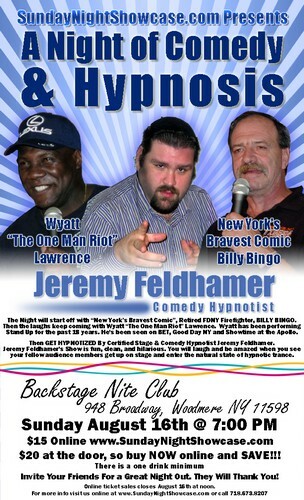 Jeremy Feldhamer,Certified Stage Hypnotist is appearingin Woodmere this Sundayand will behypnotizing all takers atBackstage Nite Club during the Sunday Night Showcase. Jeremy Feldhamer provides unique entertainment. He combines the fun of total audience participation with the incredible abilities of the mind. You will laugh and applaud your friends and family up on stage! You will also see them as you have never seen them before. For instance, the quietest introvert will often times become the brightest star. We askedJeremy, who can be hypnotized? “Every person who has a desire and a minimum IQ of 60 may be hypnotized. Sunday’s show will also include two great stand up comedians. New York’s Bravest Comic, Billy Bingo, a retired fireman turned stand up comedian. And Wyatt “The One Man Riot” Lawrence. Both have been seen on TV and Comedy Clubs around the world. In conclusionJeremy stated, “I hope to see everyone at the show, and oh yes, it is for real. If you have any doubts, join us and volunteer!” You should make reservations early as thisshow is very popular. Singles are welcome to attend, stay and mingle till the end.If you are single use code “single” for $2 off online tickets or mention you are a single at the door for $2 off. Sunday Night Showcase is taking place every Sunday night at “Backstage Night Club”. Located at 948 Broadway in Woodmere, NY. $20 at the door, so buy NOW online and SAVE!!! Invite Your Friends For a Great Night Out. They Will Thank You! Online ticket sales closes at noon on the day of the show.